This beautifully designed glass vase is full of elegance and style, a must have this season and a fabulous gift for every occasion; whether it be for a wedding, Christmar or even a treat to yourself. The timeless shape and design has been a popular choice and is now available in two wonderful sizes. 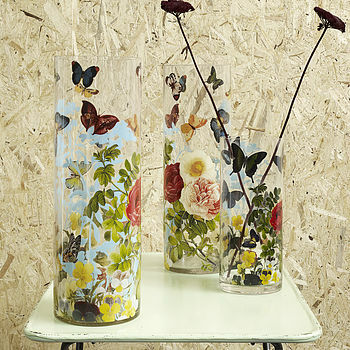 Clear glass decorated with flowers and butterflies; perfect to use as either a vase or an ornament.